"This is a true story about South African family man, Patric Chamusso (Derek Luke) who is an oil refinery foreman and he teaches soccer as well during the hectic days of the 1980's. All he wants is a happy life with his family and he's happy with what he has. He has found happiness and peace. But when he along with his wife are jailed without much explanation, Patrick could not take it. After being beaten and harassed for unexplained reasons, he decides to fight back. He chooses to fight back for what the CIA has taken away from him, his happiness. He joins an organization [the so-called terrorist group called the ANC--African National Congress--] and fights back until he realizes that the system itself is corrupt. He is being sought by CIA agent Nic Vos (Tim Robbins) who interrogated him during his arrest. Then begins a furious action thriller with striking results." Because the story is true in the context of apartheid, suspicion, moral dilemma, brutality, bravery and love, the conclusion is astounding. I will say no more than this. "Catch a Fire" is a hard, yet redemptive story. See my friend's, Bill Kinnon's, review of "Catch A Fire" and read his comments to my review (click "comments" below). Thanks for pointing this out, John. I'm attempting to book a date with my wife, Imbi, to see it this evening. A number of good friends of mine were in a South African anti-apartheid Christian band called Friends First. Some of their stories are quite wild. I look forward to their response to this movie... as well as my own. I'd be interested in your response to the story. I'm glad you're going to see it with Imbi. Still trying to get her to be willing to leave the house. It's cold and damp in Toronto. And she has writing to do for her Wycliffe College courses. (Ah, the life of being married to an MTS student.) I may just have to go by myself...or not. How violent is it? I am a wimp. But I appreciate movies that have redemptive themes... Would you recommend it for someone who had to close her eyes through the entire first part of Saving Private Ryan? Believe it or not, I'm a wimp when it comes to violence as well. The tension in the movie is pretty strong - I felt like I was on the edge of my seat for most of it - but the actual violence is restrained - we more see the effects of that violence. I was profoundly moved by the film, as was Imbi. We are both lovers of South Africa. I went the first time in 1996 - Imbi, a year later. I was there shooting a documentary with an African-American pastor and was travelling with a team of Americans (who were predominantly black). On our arrival in Cape Town, I witnessed a young female team member being rudely hassled by a six foot six inch, blonde customs person. Five years after the end of apartheid. She was African-American. I was treated with warm politeness. I'm pasty white. After my friend told me the story, he took about half an hour before he spoke again - the memory still burned. Would that that was his only experience of evil in his country. He experienced much worse. And he discovered during the Truth and Reconciliation commission that he and his "twin brother of another mother", the white Afrikaner drummer he'd played with since his late teens were both on a hit list of the secret police. His Afrikaner twin was the nephew of a famous white South African poet. He was bringing dishonour to his family and race by his love for and friendship with a Zulu man. I've seen the realities of race hatred that still exist in South Africa, even amongst Christians. And I am shocked that there wasn't widespread bloodshed when Apartheid came to an end. That can only be the hand of God. Catch a Fire captures the sorrow of Apartheid South Africa. 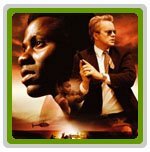 Tim Robbins as the conflicted Police Colonel Nic Vos, shows the depths to which we can sink in "protecting our world." (I have no doubt that Robbins is making a strong statement from his own political point of view.) Derek Luke is exceptional as Patrick Chamusso. His transformation from a man focussed on his work and family to a freedom fighter (terrorist to the Apartheid South African Police Special Brand) is a nuanced performance. This is a very good film. One I would strongly recommend. And there is redemption in the film. Will it make you uncomfortable? I certainly hope so. I will be sending my three teenagers to see it. Thanks, John for recommending it. I'll be talking about it more on my blog tomorrow morning. Thanks Bill... I think I will go see it, and recommend it to others. Today at church my pastor finished up preaching through the book of Jonah, and he focused on the hard message that chapter 4 brings to those who believe God's grace is only for "certian people." Sounds like this movie goes right along with the Sunday message today. Thanks, John for the link - and my comment should have been addressed to "Susan and John." Susan, The Jonah reference is timely. Thanks for reminding me of the passage. Hope you ECC types have been keeping up with my friend and ECC pastor Brad Bergfalk's sojourn in Kenya while he's on sabbatical.